Thanks to some readers for contributing this list of names. Links below for verification. Fong Sip Chee is the father of Arthur Fong. Major Fong Sip Chee was Minister of State (Culture) in the 1980’s. Arthur Fong stepped down from politics in August 2015; he was the Assistant VP of OCBC bank from 1996-2000, and has been an NLB board member since 2011. Ho See Beng is the father of Ho Geok Choo. Ho Geok Choo was elected as a Member of Parliament for the West Coast GRC from 2001 to 2011. A former Vice Chairman of the PAP Women’s Wing, Mdm Ho has close to 30 years of experience in GLCs and the private sector. Former PAP MP Choo Wee Khiang is the uncle of Desmond Choo Pey Ching, PAP candidate for Tampines GRC. 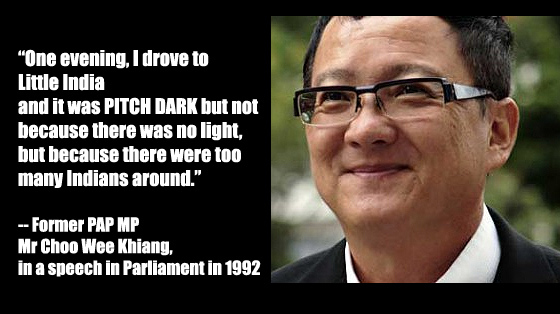 Choo Wee Khiang was charged with 3 counts of corruption in 2011. A quote by Mr. Choo below. Ong Ah Heng was the Member of Parliament for Nee Soon Central until 2011. 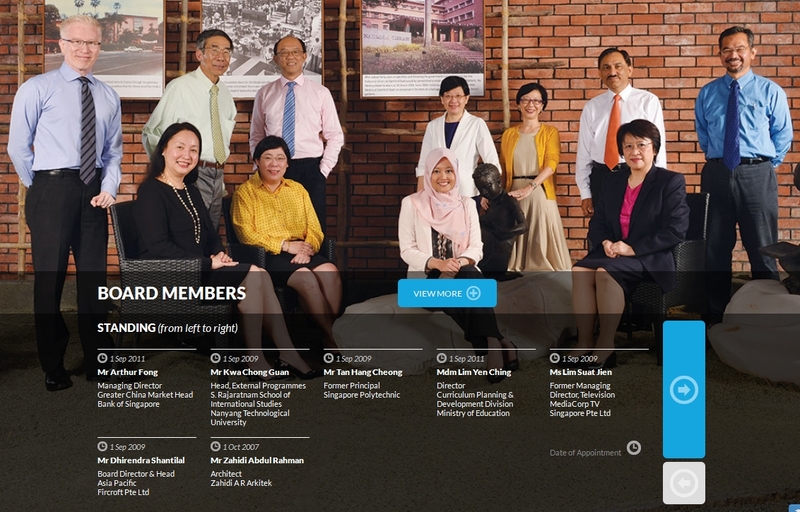 He was appointed a non-executive Director of ComfortDelGro Corporation Limited on 18 February 2003. 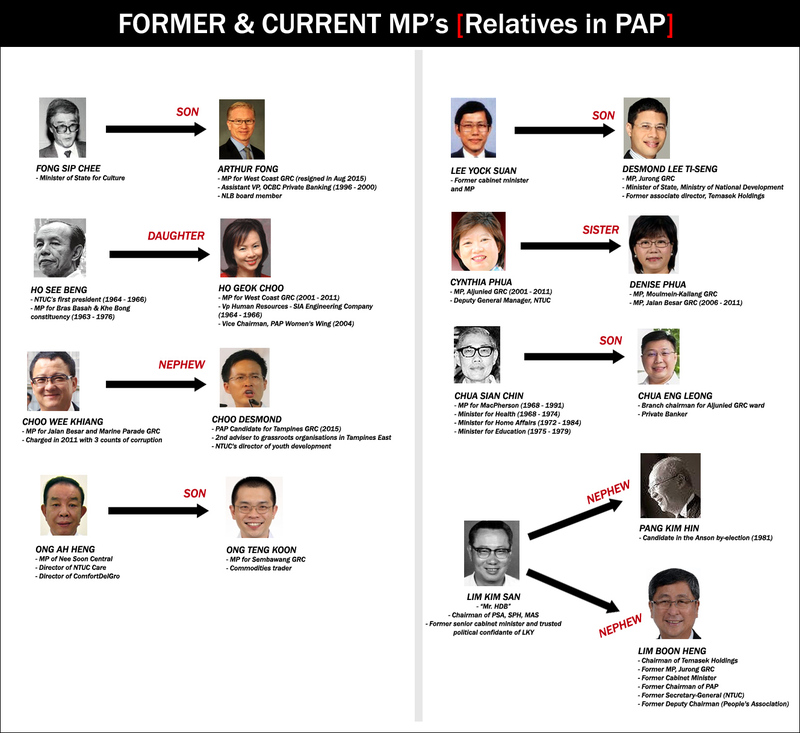 Ong Ah Heng is the father of Ong Teng Koon, a commodities trader and MP for Sembawang GRC. Lee Yock Suan is a former cabinet minister and member of Parliament. His son is Desmond Lee Ti-Seng. Reader Tip: Mentioned in Chinese newspapers during former elections that Cynthia Phua is the sister of Denise Phua. Former cabinet minister Chua Sian Chin is the father of Chua Eng Leong. Lim Kim San was a former senior cabinet minister and trusted political confidante of Lee Kuan Yew. Pang Kim Hin is his nephew. A reader says that the Chinese newspapers reported that Lim Boon Heng is a nephew of Lim Kim San as well.